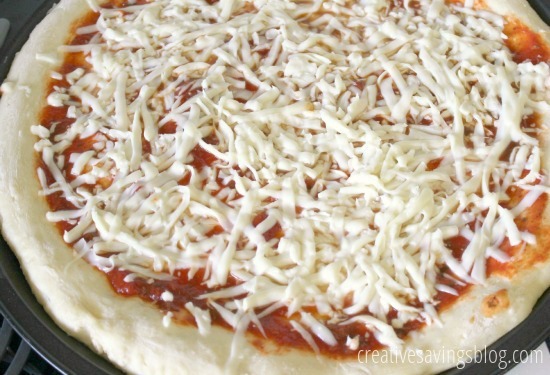 Did you know that you can freeze pizza dough? At first, I thought it was crazy. Everybody knows that a bread with yeast in it needs a warm place to rise. The freezer, is most definitely not. But after some encouragement from friends that it was actually possible, I decided to give in and experiment myself. I was extremely happy with the results! In fact, it will be very rare for me to actually make a fresh batch of dough from now on. The freezer is just way too convenient, and allows me to whip up 2-3 recipes of pizza dough at one time. Which for this busy girl, is a must. I feel I must give a bit of a disclaimer though. Meal planning with homemade pizza does take a little longer because the dough thaws and rises a total of 8 hours, but it is really nice to pull a bag out of the freezer in the morning, and not even think about it until dinner time. Step 1: Mix up all the ingredients for pizza dough, but do not let the dough rise. Then shape into a ball, coat lightly in flour and place in a quart-sized freezer bag. Make sure you label your bag, otherwise, you'll never know exactly which large frozen ball is pizza dough vs the cookie kind! And depending on the outcome you were expecting, you could be quite disappointed. Step 2: When you are ready to use the dough, pull the bag out of the freezer the morning you want to make it for dinner. Even though the dough was coated in flour before hand, it still has a tendency to stick to the insides of the bag. Don't give up! 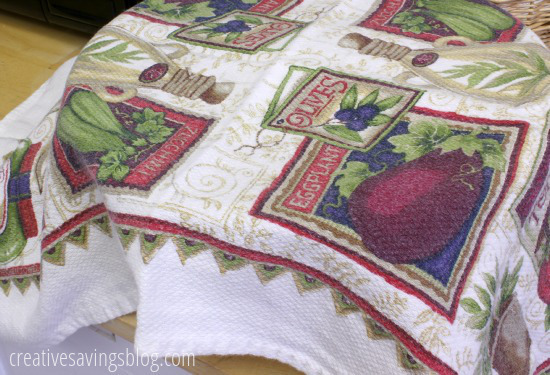 Place dough in a large bowl, cover with a kitchen towel and let rise in a warm place for about 8 hours. At first, it might seem like the dough will never rise…it does takes quite a while to start. But once it gets going, it rises to almost double what it was before. Step 3: When the 8 hours are up, the dough is ready to spread into a pizza pan, and sprinkled with extra, and I mean extra cheese. I suppose a few other toppings will do too. If you insist. Mmmm…doesn't it look soooo good? If you still want to make this dough ahead of time, but need to use it sooner than the 8 hour timeframe, place dough in the fridge, and it will rise in half the time. For lunch, just make dough first thing in the morning, and for an evening meal, make in the early afternoon. See, now wasn't that easy?! 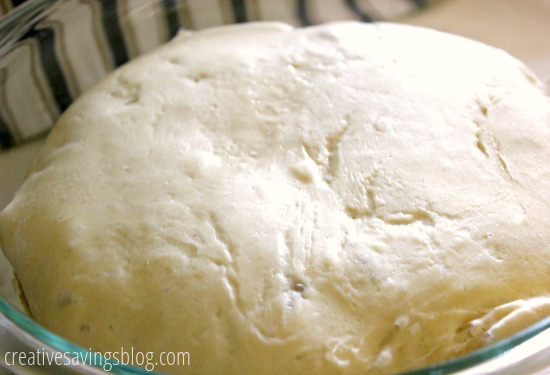 Have you ever tried to freeze homemade pizza dough before? 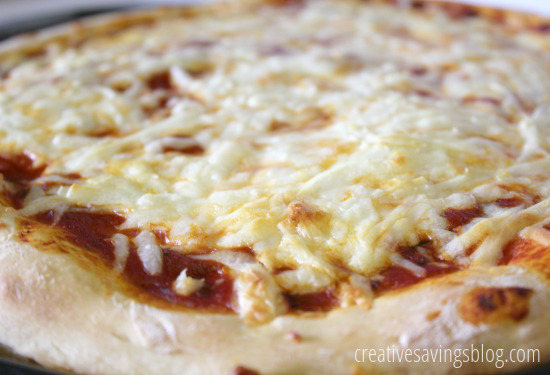 Make sure you check out this recipe for the BEST homemade pizza dough, and if you missed any of the freezer cooking series, you can catch up on this page. I freeze pizza dough all the time but the difference to your method is that I let it rise before freezing. I usually make double dough recipe, let it rise and then divide into two, use half and freeze the other. Seems to work either way! About how many hours would you say the dough as to rise after it comes out of the freezer? I wonder if it would be less time because you’ve already let it rise? I do that too! My recipe actually calls for 2 rises, so after the first one, I divide the dough and freeze half of it. I usually give it about 7-8 hours to thaw and start rising again. Some recipes call for 2 rises versus 1 rise A) for the flavor development, more time for the yeast to feed on the starches in the dough, which causes more fermentation- responsible for the robust, yeasty flavors in some pizza doughs, breads, and croissants, and B) to further strengthen the gluten developed in the pizza dough, especially useful if the baker, cook plans to be hand-tossing their dough versus simply pressing it out- leads to a chewier dough with more “bite” instead of a bread-like/Chef Boyardee crust. Kaylyn, if you use instant yeast, you only need to raise your dough once. If you use dry active yeast it is recommended to raise your dough twice. This applies to any bread dough. Often times recipes with a different rising time are due to the opinion of the person with the recipe. We all take shortcuts and some people modify their recipe. don’t see any differences in the outcome and pass it on with the modifications. I have several recipes with the exact same ingredient list, and very different instructions from baking temps/times, to ways to mix it/ rising times etc. I also think that one person’s “good” recipe and another persons “bad” recipe has far more to do with personal taste and preference in what you like, than how the actual recipe turns out. We make our own pizzas, but have always used the dough mix, since it’s so fast & cheap…probably not as healthy if I were to look into the ingredients of it though; thanks for sharing! I used the dough mixes for the longest time – no shame in that!! I find the exact opposite works best for me. I let my dough rise for two hours. Punch down. Freeze in small baggies. A few days before pizza night, I put a bag in the fridge. I let it defrost in the fridge. I don’t take it out of the fridge until the minute I’m about to assemble the pizza. The very cold dough seems to behave better than warm dough, which has a tendency to stick and/or bounce back. I find the cold dough much easier to work with. I bake it then at 450 for 25 minutes and it comes out perfectly. That’s interesting that you let it rise before…I’ll have to try that! 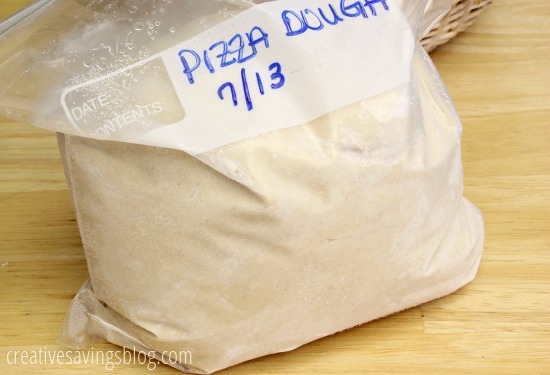 How long can you freeze pizza dough? 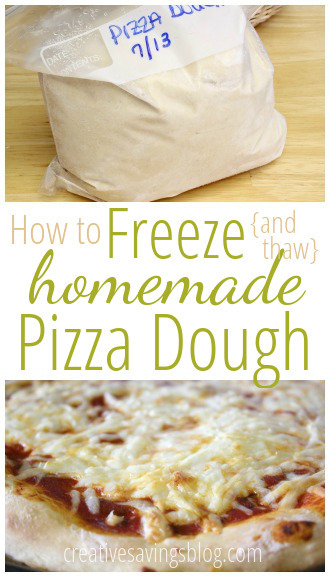 Freezing dough is so easy, thank you for posting this. Sometimes I put the dough on my big (holds 30 cookies) cookie sheet just like I’m making the pizza but only half bake it, and then cut the big crust in to 4 pieces. Then, putting a piece of wax paper in between each crust, I put them into a gallon ziploc bag and put in the freezer. Depending on the thickness of the crusts, you can put 4 or 5 in a bag. Then whoever wants a pizza can pull out a frozen crust, put it on a greased pan or cookie sheet just as it is, add the desired toppings and make their own individual pizza. I usually have individual sized toppings in the fridge. No fuss, no muss, it works very well if you have hungry teenagers! I never would have thought of this! Thanks so much for sharing — what a great idea! Oh no! I’m wondering if your yeast is bad, or if you possibly killed it with too hot of water, or didn’t activate it with too cold of water. Yeast is such a finicky thing! I speed up my thaw by keeping it in the plastic bag, and placing it in a bowl of hot water. Then flipping it over and changing the water when the water has gone cold. Even though it’s sealed, I leave the seal out of the water/bowl so there is no leaking. i usually have a dough ready to go in 60-90min this way. 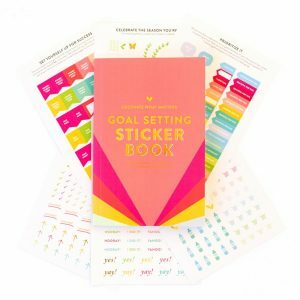 This is such a brilliant idea — thanks for sharing! I’m going to try it the next time we want pizza. We have a bunch of dough in the freezer, but sometimes forget that we have to pull it out first thing in the morning for dinner! can I actually freeze the pie along with its toppings? if so, how long will that last – say for BBQ chicken? I’ve frozen it with cheese and sauce before, but I wasn’t as happy with the end result. Once you start throwing other things on it you have to be careful of freezer burn as well. I freeze pizza dough all the time, but make a vegan dough with no yeast so no rising. Works very well and the pizza crust is awesome!